The importance of evaluating overweight individuals has increased as the epidemic of overweight has worsened. Physical Activity and Obesity, Second Edition, addresses an array of topics that explore and divulge the links between physical activity (or inactivity) and obesity. Leading scientists from various backgrounds team up to provide an unrivaled resource examining the latest research and developments in the field. 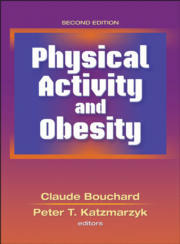 Each chapter provides researchers and practitioners with a clear explanation of the concepts, research techniques, and results of studies critical to understanding physical activity and the obesity epidemic. points to research areas that need further exploration and attention. The nine parts of the book flow logically and address obesity in all populations, including children and adults of various backgrounds, ethnicities, and social classes. An overview of the methods used in assessing the levels of sedentary behavior and physical activity is given, followed by a global view of the problem of physical inactivity and obesity. Readers will learn about the key determinants of physical activity levels and obesity and the links between a sedentary lifestyle and the risk of obesity. Other topics examined include behavioral and environmental correlates and determinants of obesity, the relationship between low physical activity energy expenditure and obesity risk, clinical implications, and policy and research issues related to physical activity and obesity. Physical Activity and Obesity, Second Edition, helps readers better understand the role of physical activity in the overall energy balance equation. The unique format, expert contributors, and complete references make this resource indispensable for researchers, health and exercise practitioners, and students studying the ever-expanding topic of obesity as it relates to physical activity. Reference for exercise physiologists, obesity specialists, sport nutritionists, sports medicine specialists, fitness specialists, and government agencies concerned with public health. Claude Bouchard, PhD, is executive director of the Pennington Biomedical Research Center in Baton Rouge, Louisiana. For more than 40 years he has researched the role of physical activity on physiology, metabolism, and health indicators, taking into account genetic uniqueness. He also has authored or coauthored more than 1,000 scientific publications, and he served as president of the International Society for the Study of Obesity from 2002 to 2006. He also has served as president of the Canadian Society for Applied Physiology and has directed the Physical Activity Sciences Laboratory at Laval University, Quebec City, Canada, for over 20 years. Dr. Bouchard has received numerous awards over the years, including the TOPS award from the North American Association for the Study of Obesity in 1998 and the Albert Creff Award in Nutrition of the National Academy of Medicine of France in 1997. Peter T. Katzmarzyk, PhD, is a professor and the associate executive director for Population Science at the Pennington Biomedical Research Center in Baton Rouge, Louisiana. He holds the Louisiana Public Facilities Authority endowed chair in nutrition. His main research interest is the epidemiology and public health impact of obesity and physical inactivity, and determining the relationships between physical activity, physical fitness, obesity, and related disorders such as metabolic syndrome, cardiovascular disease, and diabetes. Dr. Katzmarzyk has published his research findings in more than 190 scholarly journals and books, and he regularly participates in the scientific meetings of several national and international organizations. He is currently an editorial board member for the International Journal of Pediatric Obesity, Journal of Physical Activity and Health, and Metabolic Syndrome and Related Disorders.